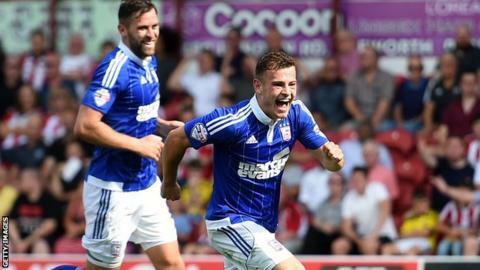 Ipswich Town winger Ryan Fraser says he has never played on a pitch worse than during Saturday's opening day 2-2 draw with Brentford at Griffin Park. Fraser, on loan from Bournemouth, put Town 2-0 up on 50 minutes. But injury-time goals by Andre Gray and James Tarkowski earned the Bees a draw. "The pitch was terrible. I've never played on a pitch as bad as that before, especially at the start of the season, never mind the end of the season," he told BBC Radio Suffolk. Ipswich and Brentford lost in the Championship play-off semi-finals last season to Norwich and Middlesbrough respectively. And Fraser says his new side need to learn from letting a late two-goal lead slip to promotion rivals. "We came into the dressing room and it was all doom and gloom, but we just need to learn from our mistakes and go again," said the 21-year-old. "Come the end of the season, this could be a vital point. "Obviously when you're 2-0 up with minutes to go and you draw 2-2 it's not nice, but then again you always learn from your mistakes. If we learn from it, it won't happen again." Town boss Mick McCarthy said the manner in which the draw was earned disappointed him. He added: "We'd have taken a point beforehand, but having played the way we have for 93 minutes, I'm absolutely gutted. It's two points dropped. "We weren't cruising because they had chances, but we had enough have put the game to bed. "We got done by a long ball down the middle and didn't deal with it, and then a corner kick."